The current low moved across india on the 16/17/18th and today lies,almost dissipated,as an upper air circulation,over M.P/Gujarat.I was expecting some rain over Mumbai today,but there was hardly any rain,only 1mm,and partly cloudy skies.Once this system fizzles out,in a day,there will be sparse rain the peninsular,I think.The IMD has forecast a WD to approach N.India from the 21st.If it interacts with the monsoon low,as is expected, it will bring rains to N.West India,but maybe again push any approaching system from the bay, further away,or make it weak. Rainfall figures along the path of the low have been moderate,with Nagpur recording 178mm on 18th morning and other centres from 30 to 70mm.Hence the average rain for the central area may improve during the week. 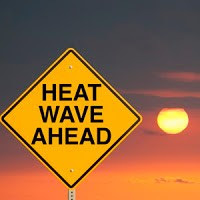 U.K. became very hot today,with Heathrow going to 33°c.Death Valley in Calif. recorded a high of52.2° on 16th after 4 straight days of 50°(thanks for the info. Jim). The N.Hemisphere is in full summer heat .